WHAT IS BEET ROOT & SPINACH LEAF? I have brought dying people back to life with beet juice, I could stop there but I won’t. There is no other food that looks like beets. There is no other food that, after eating it, will turn your urine and feces red. 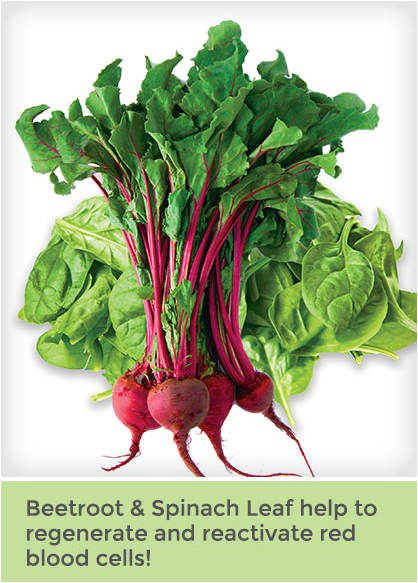 Beets are without a doubt one of nature’s most powerful nutritionally dense super foods. They are loaded with natural, organic iron and carotenoids. And, you can consume all the beets you want and never have to worry about getting too much iron (as can happen with other iron mineral supplements). Beetroot builds blood. I have had patients who were dying from anemia or blood loss, and I was able to bring their blood count back in 24 hours, or less, with beet juice. Spinach is also a very rich source of organic iron (even more than beets) and it also contains a powerful array of nutrients. Both of these plants are famous for their blood building ability. WHAT’S IN BEET ROOT & SPINACH LEAF? Risking getting nutritionally boring, beetroot and spinach leaf contain about every vitamin and mineral known. They are truly nature’s super vegetables. They are both very rich sources of carotenoids, which are highly regarded as preventative for cancer, especially breast and prostate cancer.